Have you ever spent a ton of time working on a blog post and wished that effort could be multiplied? What people who are cranking out media like nobody’s business understand is the art of repurposing their content. Essentially you take the content you just spent a ton of effort producing and reuse it in creative ways to get some extra mileage out of it. I’m not just talking about posting in on different platforms (though we do have some very practical tips on how to get the most out of each platform) but adapting the content itself to a new medium. We show you exactly where to start, how and when to repurpose, and what you need to be thinking about so that your new blog post, video, newsletter, or podcast episode resonates strongly with you audience. Don’t be afraid to put the same thing out on multiple platforms—utilize the strengths of each platform. Put a unique spin on re-used content and provide unique value. Write uninhibited—don’t write for a platform or medium at first, just write. 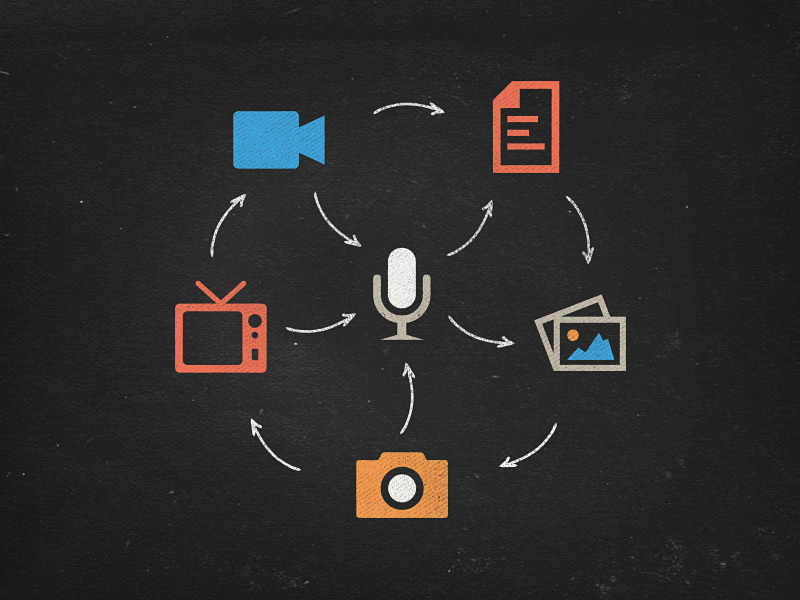 Audio helps refine your writing and your speaking simultaneously. Get to a place where you can read what you wrote and have it sounds like talking. Give people value in as many formats as possible. If you want you videos to cater to the common attention span, five to seven minutes in length is the sweet spot. Using open loops in your emails is going to make sure people keep opening. The recycling of content gives an opportunity to refine what your core message is. 19:58 Sean: Repurposing content is about getting more mileage out of the content you’ve already spent time producing. For instance, if you wrote a blog post, you turn it into a newsletter, a podcast, or a video. You’re recycling your content. The effort you put into creating something initially doesn’t have to just be for that one thing and then it goes away forever—you can reuse it. 20:33 Some people are thinking, “Why not create new stuff? People don’t want to see the same thing over and over again,” or, “If they like listening on audio, I should keep doing audio. Why should I do written, video, or a newsletter if I’m a podcaster?” A lot of podcasters say, “I’m a podcaster. I talk into a microphone. If you want to hear me, listen to me.” They don’t go the extra mile to repurpose that. What if you took the best pieces of the actual words you spoke and posted them as highlights, put them in a newsletter, or created a graphic that you tweeted on Twitter? Do hand lettering of the best parts of your podcasts. There are ideas of ways you can repurpose the content you’re creating in one medium or another, and a lot of people aren’t taking advantage of that. 22:57 Brookes asks, “How do I repurpose content without my most loyal audience thinking ‘I’ve already seen this’?” This was probably the number one question we got. The Magic of 7 is when people need to hear things seven times for it to really sink in, so you don’t need to be worried about this. I’m going to turn this around on Brookes. You follow me, right Brookes? What do you think when you see things multiple times with me? 24:43 I do this with people I’m a loyal follower of: if I see something and I like it, I’ll see it on another platform and I’ll like it or favorite it there too. Sometimes it’s fun to see that content again; maybe you see a new angle of it. When you’re the loyal person, you’re not getting upset when you see something multiple times. If you’re not getting unique value on multiple platforms where you follow someone, you can always un-follow on one of those platforms. That doesn’t mean you’ve lost a person. Don’t be afraid to put things out multiple times on multiple platforms. You want to repurpose utilizing the strengths of each platform. 25:51 Ben: As the person producing the content, you’re going to be really sensitive to how many times you’re saying something, but nobody, not even your most loyal follower, is as familiar with what you’re saying as you are. We take our understanding of how often and how many places we say something and we apply that to other people’s experience. Their experience is not the same as ours, and they’re likely getting just a glimpse of what we feel like we’re spewing out. 26:37 I think of songs and the relationship we have to songs. Every once in a while I’ll look up the lyrics to a song because I want to see the poetry in it. Sometimes I want to watch the music video and see the artistry and how it’s presented. Sometimes I just want to hear the song. Sometimes I want to hear the story behind the song. Putting your content on different mediums gives people unique experiences with the same content, and the experience is part of what they’re looking for. When I feel hesitant to share the same thing across different mediums, this encourages me. Some people subscribe to multiple mediums, but others are particular and only get value out of one or two mediums. It does you a favor when you replicate content on different mediums. 28:04 Sean: Ryan asks, “What are the strengths to focus on for each content medium?” Kathy asks, “How much do you need to change something if you are going to use it across various platforms? I know you should tailor it to the strengths of that platform, but is it ok to post almost the same thing? Maybe post it in a newsletter and then reuse it for a blogpost?” It is okay to post the same thing, but you do want to taylor your content to the strengths of each platform. 28:44 Twitter is playing much more strongly to their own native content, just like Facebook. Previously, if you posted an Instagram link, it would have the Instagram image in there. That’s partially on Facebook, since they bought Instagram. If you post a YouTube link on Twitter, it does not show the thumbnail automatically—it’s just text. There’s no visual element to it, because now Twitter allows you to upload native video. They want to push that a lot more. They’re introducing autoplay. Keep up to date on what platforms are doing, highlighting, and promoting, because everything is visual. 29:28 You have to focus on the visual. You could post a text link, but not many people will care. With Twitter, I would post a link to the podcast episode and include a featured image. Surprisingly, nobody is creating featured images for their podcasts because it’s work. People want to talk into the microphone, write two sentences, and publish it to their feed. We’re making images, because the featured image gives our content some legs. It has movement and it can go places now because people care about it. Audio is impenetrable. Audio is an investment—you can’t scrub through audio and get a visual sense of what you’re going to get. You can’t get into it; that’s why we do shownotes. 30:48 Ben: SoundCloud specializes in audio, but they give you a visual representation of the wave form and they have thumbnails for people who have left comments. They rely heavily on that, because audio by itself is often not enough for people to make the investment. 31:11 Sean: They let you upload an image, too. As much as possible, they’re trying to leverage that visual element. With Twitter, I would upload the featured image I created for this unique podcast episode, and then I give people a takeaway as much as possible as I can fit it. If someone listened to this podcast, what’s the most important thing they need to take away? I give it to them right there so they can get it without even clicking the link. 31:43 So many people want traffic, downloads, to see the metrics or the analytics on their click counter, to use their custom url and watch the numbers, but don’t worry about that. On Reddit, do you ever look at the page and think, “Wow, 5,000 upvotes on this.” That’s not representative of how many people actually saw it. People can click that and not upvote. People can not click that and just read the headline. That’s not something you can measure. You can deliver value to people and not even know they exist; I might not have have them on any kind of metric because they didn’t click or download anything, but I still gave them value. That’s long-term goodness. 32:30 Later this year, we’ll come back to doing my daily video show, seanwes tv, but in the meantime we post video promos for each of these episodes. We take the very best part and we give you a video highlight promo of this episode. We do that with every episode, and I was putting those on Twitter. That gave us more visual, and you need everything you can do to get that visual. Twitter stopped showing the thumbnail for YouTube, so now I have to do an image uploaded natively to Twitter, a link to YouTube, and ideally, the podcast, which leaves me with almost no characters. 33:42 For Facebook, short form excerpts work best. If you have a blog post, it’s probably best not to post the whole blog post in your link. When making a podcast, there is the title, the outline, and then shownotes are made. We use pull quotes, block quotes, and different headers to visually pull out parts and make them interesting. The shownotes go off my outline I made beforehand, but if something serendipitously happens, they pull out those interesting nuggets. 35:44 Once you create that, that’s not only the excerpt for your podcast and what goes into the feed, but you can copy and paste that as a Facebook post. Instead of your full shownotes or just the title, you have this excerpt showing why someone should care about this thing. 36:05 Ben: When you keep in mind that you can use this content for other mediums, it makes you more intentional about how you shape the original content. You may have put out a blog post before and broke it up with some images or something, but now you have to think about some of this going on Facebook or Twitter. You might want to make an original artistic piece out of a specific section. When you think about all the different mediums your content could become, your original content becomes much richer because you’re infusing it with different expressions you can use in other mediums. 37:03 Sean: You’re spending time making it rich like that. Maybe you illustrate a featured image and spend a bunch of time on it. Mine are pretty simple, but I spend at least an hour on them. If you’re investing that time, you now have something beautiful. It’s art in and of itself, and it can be used to get people’s attention. That’s something you can put on Instagram, because Instagram is all about the visual. People can screenshot their iPhone of a Facebook status and upload it to Instagram, but that’s not the point. 37:55 Instagram is about something visually interesting and beautiful. Think about the people you follow, those top accounts. Think about the difference in content between the people you follow because you love the images and the friends you follow because you were automatically connected to your Facebook friends. What do you care about? What are you actually following? What if those people weren’t connected to you on Facebook, and you came across their feed and you didn’t know them. Would you follow them? Probably not, because they’re not posting visually interesting images. 38:33 Ben: For you, Sean, it takes quite a bit longer to create a lettering piece than it does a featured image. From time to time, I’ve seen you use a lettering piece as a featured image. For the way you’re curating on Instagram, that works out better for you to be able to share them as one or the other. Sometimes, I’ve seen you create a featured image that you wouldn’t normally share on Instagram because it doesn’t match what you’re curating, but you’ve done a lettering piece in the past that’s on your Instagram that also works with the new content you’re providing—so you repost it. 39:15 Sean: I’m doing that with this 30 day series. I have created some unique lettering and I’ll probably create more, but my minimum for a lettering piece is probably three or four hours, because I want to make it really nice. I can’t do that every day for new posts, but I’ve created so much over the last five years that I have so many images that are relevant and I can repurpose them from the past. A lot of people haven’t seen them before, and for those that have, it’s been years. 40:02 Ben: On Instagram, when you do re-share, I enjoy that Instagram doesn’t have a restriction on how much you can put in the first comment. You can say something short or you can provide more value. I see you provide unique perspectives and value in that section. Do anything you can to put a unique spin on re-used content and provide unique value. 40:38 Sean: I try as much as possible to write unique content to put something fresh on a new platform. Have you ever seen on Instagram, in the captions of someone’s picture, how they have line breaks? Have you ever tried to do that when you type in there? If you do, it won’t work. Here’s a tip: go in your notes app, write it there first, and put three return carriages between the paragraphs—not two. If you write it in notes the way you want it to look, it won’t work. You need three return carriages. Each paragraph has to end with a period. If it ends with an emoji, it won’t work. If you want to write a bunch, break it up so people don’t get overwhelmed by a wall of text. 42:18 Let’s say you did a podcast and you have a featured image, you’re good to go. I benefit from this a lot. The effort I put into a featured image is serving me so well. For your podcast for which you don’t put in the effort to make a featured image, on Facebook, it’s your album artwork every time. We’ve seen that artwork a million times. If I see your podcast album artwork for the 26th time in my feed, I’m going to stop caring. It feels like you’re spamming the same thing over and over because we’re visual. We’re not reading your title and seeing that it’s different. 43:06 By putting in the effort to make a unique image, it’s always fresh. It also gives you content legs. Have you ever tried pinning a podcast on Pinterest? I don’t think so. I get to have this huge board with hundred of pins people like and re-pin that I get traffic from, because I say, “Here’s how to repurpose your content. Here’s six ways to find motivation.” That’s the kind of stuff people pin: infographics, things that talk about self improvement or a takeaway in and of itself. Pinterest is a traffic source you’re probably missing out on if you’re not focusing on the visual. People like sharing valuable content because of the credibility it gives them. 44:00 Ben: When you have a featured image or something to share that is inherently valuable, you’re giving people the opportunity to add credibility to themselves by sharing it. 44:15 Sean: If it’s just a plain link with nothing visually interesting, I’m less inclined to share. If you give me something that looks good, it’s going to make me look good when I re-share because I’m giving my people value, so I’ll do it. 44:35 Google+ is still around. You may think it’s a ghost town and you don’t use it, but you’re making a mistake, because it’s owned by Google, and Google controls the search of the world. Everyone uses Google and they care, so you have to care because they care. Believe it or not, there’s a core group of people who use Google+. They’re generally ani-Facebook, there’s not much overlap, so there’s a different audience. For the people who do use it, because so few people use it, if they follow you, that’s pretty good attention. Think about the engagement level of the people who are there because they’re pretty die-hard users, not to mention the SEO benefits. 45:32 Google cares so you should care—you might as well repost there. Think of it as an elevator pitch. Imagine you’re in an elevator going up to the 34th floor with someone who’s going up to the 36th and they ask, “What are you doing today? What have you been working on?” to which you say, “I was working on this blog post.” They say, “Cool, I’ve seen blogs. Back in 2002 they were cool.” You respond with, “They’re still cool, they’re good—” Ding! It’s your floor. You wasted it. 46:15 You could have said, “I’m working on a blog post right now for podcasting entrepreneurs, so if you’ve got a show, this is going to tell you exactly how to…” You’ve got their attention. Tell them why they should care. Your “elevator pitch” should be the description you write when you share on various platforms. 46:37 Post on Google+ and tell people why they should care. Have something visual. Google+ will get things to go viral because it will show things that are trending or hot in your feed, so if a bunch of people latch onto it and it’s interesting and valuable, you have some potential there. 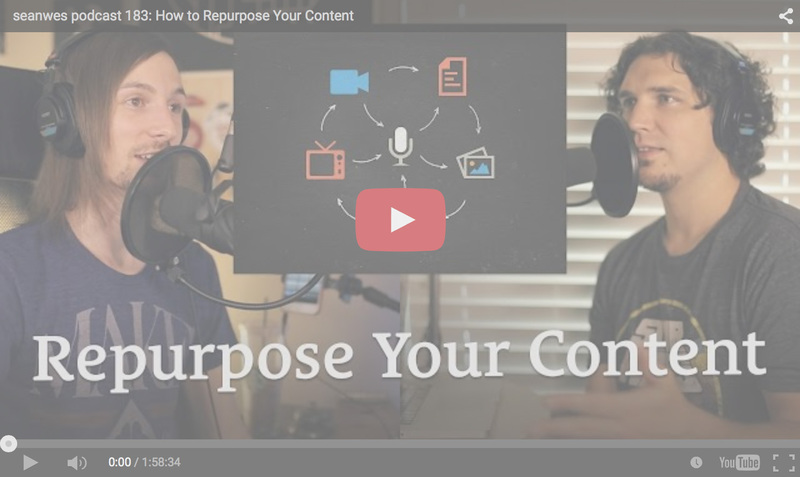 How Do You Repurpose Content? 47:09 It all starts with writing. That’s why I start my day with writing, or walking and thinking about writing. Start your day with writing because everything starts with writing. Aaron asks, “Is there an order of importance for the different mediums? Everything starts with writing, but what comes next?” It does all talk with writing, so I want to talk about that first. Don’t write for a platform or medium at first, just write. 50:05 Get it out there—do a brain dump. If you’re more of an out loud thinker and you want to record your voice, then transcribe it, you can do that. However you want to get it into writing, do that first. Get it out initially. The first thing you can do, the most obvious thing, is a blog post. Blog posts can be turned into newsletters or newsletters can be adapted from the blogposts. From a blogpost, your writing can be used to record audio, because that’s the next easiest step to go to in terms of production simplicity. What areas did you stumble over while you were reading? How can you revise what you wrote based on where you stumbled while you spoke? In what ways do you find yourself naturally speaking that you would like to change? What are your most common filler words and phrases? Are you aware of them? Listen intently to try to find the places that you weren’t sure what to say next; what did you fill it in with? How can you practice those out? What about your writing style would you like to change? What forms of language that you speak naturally could be infused into your writing? How do you normally articulate things verbally, and how can I bring that into my writing? 52:42 This is going to give your writing voice a much more natural sound. It’s remarkably difficult to write with clarity and simplicity. You’d think, “Using big fancy words is going to make me sound smart and that’s hard,” but that’s not what’s actually hard. I used to write with all kinds of big words when I first started writing, and it was bad. I was trying too hard to be concise and going about it the wrong way by using big words. I thought, “This big word means everything I want it to mean, and that’s concision,” but it wasn’t the good kind of brevity. It wasn’t clear. 53:28 If my vocabulary represented 100%, I was trying to use 100% of it. It’s really difficult when you’re stretching to reach the very ends and bounds of your vocabulary; you sound and feel awkward. I like to think of it in terms of 90%—use 90% of your vocabulary. You’ve got some good sleeper words hidden away, and you don’t have to use them. It’s okay. Simplify it down a little bit. As your vocabulary grows, 90% of it is going to sound pretty good, and you’re going to wield those words a lot more effectively because you’re not stretching yourself so much. 54:15 Ben: The ability to communicate something simply but effectively grows over time.You would think that using a simpler vocabulary is easier, but it’s the masters of language who know how to take a simple handful of words and say what they mean in a way people can understand and assimilate. 54:47 Sean: Talking about this topic makes you so self conscious about how you’re talking. If you see someone speaking or writing with such clarity, you know they’ve written millions of words. They’ve put in the practice and that’s the only way to get there. Once you go through the revising process of writing, reading what you wrote, and listening back, your writing and reading voice will morph into an epic hybrid. 55:36 I often read what I previously wrote verbatim throughout the show, but because I’ve practiced it so much, you don’t know that I’m going off notes. It’s going to become less apparent that you’re reading. You listen to some podcasts and you can tell they’re reading; it’s hard to read iTunes reviews and sound like you’re not reading. You can tell the difference. Eventually, you want to get to a place where you can read what you wrote and it sounds like talking. 56:17 Ben: The thing I really like about this practice of going through all of these different steps is that I am an out loud thinker. It’s encouraging for someone like me to hear that speaking can also be a starting point. Sometimes, while I’m thinking out loud, I observe that I’m having trouble articulating for myself this abstract idea in my mind. This practice helps me, even in my out loud thinking, to express myself more clearly so that even I can understand myself. 57:15 Sean: From writing, the next easiest thing is audio. If you are interested in recording audio, if you’ve been blogging for a while and you want to try podcasting, check out Aaron Dowd’s show on the seanwes network, the Podcast Dude. He’ll help you make an awesome podcast that people will actually want to listen to, and he helps with the technical stuff, too. It’s a unique show, because a lot of people focus on the technical stuff—mics, presets, pop filters, EQ, compression, etc. Aaron gets into that stuff, but it’s not just that stuff. He’s telling you how to prepare, how writing can super-charge your podcast, how to deliver, how to give people what they want to hear, and how to listen to them and not just speak. 58:09 Ben: Being successful as a podcaster is not just about the technical stuff. There are a lot of different aspects to that, and he pulls those in really nicely. 58:20 Sean: When it comes to podcasting, we’re assuming you have decent sound quality. It just grates on me otherwise. I want so badly to listen to some podcasts, because I want to hear what these people have to say, but I can’t bring myself to listen because the audio quality is bad. I hear the room noise, they have guests and they don’t even silence out their own track, let alone make it sound good and use a good mic. I keep my eye out on all kinds of marketers in different industries because I’m studying. I’m taking away golden nuggets from even the sleazy corners of the market and bringing them to you. 59:07 I know people that have $97 a month membership sites and they don’t build their own platform and do all this custom chat system you guys take for grated; they use Facebook as their membership site, and they hire a virtual assistant to add and remove people when they join or cancel. These people have 800 to 1,000 members—that’s almost $100,000 a month—and they don’t invest in quality microphones. I’m pretty sure they’re speaking into the built-in desktop or laptop mic. I want to hear what they have to say and I know they have the money to invest, so why are they doing that? 59:55 Let’s assume you care about the audio quality and you’re actually preparing and listening to Aaron Dowd on his show helping you make a successful podcast. The beauty of audio is that the vast majority the people who start listening to an episode will finish listening. That’s huge if you can set that expectation and deliver on it. Give people quality and they’re going to stick around. 1:00:34 You have peoples’ attention for however long your podcast is. How many people in your life give you their attention for an hour every single week, where they don’t say anything and they just listen to you very? 01:01:13 Most of us don’t have people’s attention for an hour where they just listen to us. That’s really powerful. I’m going to contrast this with video, and there’s pros and cons to each; each has it’s own strengths. When it comes to video, take advantage of the visual as much as possible. 01:01:33 I’m not saying you can’t do talking head videos, because I do those myself, where you’re just looking at the camera and delivering a message. That’s okay too. People can still get value out of that. It’s very engaging for people to see your face, and it’s very nerve wracking when you’re first getting started. You feel self conscious; it takes a while to feel comfortable. Now, I feel pretty comfortable, Ben. I feel like we’re hanging out with friends, not like scores of people are watching us live, but when you’re first starting out you have to get accustomed to it. 01:02:10 Even if it’s just talking, it’s very powerful to see someone’s face and listen to them speak. It feels like you’re there and when you meet them in person, you feel like you know them because you’ve seen them. All that said, there’s a lot of things you can take advantage of visually with a video: you can add graphics, screen shots and photos, of show animations, illustrations, or workflows. Take advantage of that as much as possible. 01:02:45 There’s no rules on video; you can make five minute videos or two hour videos, but understand that the engagement levels are different across different length videos and there’s also a sweet spot. That sweet spot is typically five to seven minutes. I’m not being super restrictive about that when I do seanwes tv; I know that I have enough of people’s trust that I’m going to deliver value, and if I’m going to be here for ten minutes, it’s because I have ten minutes of value. 01:03:22 You’ve got to think about the type of people watching you on a video, where they are, and what their context is. They’re probably sitting in front of their desktop and multitasking with multiple windows open in their browser, or maybe they have a mobile device and they’re holding it in their hands. They’re engaging with you and watching it, but because they’re holding it, their hands are going to get tired and they’re going to get bored. What else can I do? I have my hands free and my eyes free; keep me entertained. With audio, once you subscribe or press play and put in your earbuds, you’re going to listen, because it takes effort to stop that audio recording. 01:06:05 Open loops in your emails. What are open loops? In a tv show where they have half a dozen or more storylines going in an episode, some of them are explored more, some of them develop, some wrap up, new ones open, some continue—these are open loops. If you’re paying attention, I often say several times in an episode, “Later on, I’ll tell you about something, but first I’m going to show you this…” You know that, at some point, I’m going to deliver on that, and you want to stick around to hear it, but you get distracted by whatever I have going on immediately. It keeps your attention. 01:06:53 Try and think of emails as a longer form story. In a show, you open up a loop—here’s a character, here’s what’s going to happen. I’m going to tell a story—here’s my email, I’m going to provide you some value. “I had a client come to me and they wanted me to do a logo design, and it wasn’t like any other project I’ve had. This client had an interesting industry, and I’m going to tell you tomorrow exactly what went down and why I was able to make more money with this client because of their industry, but today I want to talk about…” See how I opened up a loop? 01:08:12 When it comes to emails, you open up a loop and you provide value. In the next email you send, close the loop. Don’t string people along. Even in tv shows, they’ll string you along a little bit, but they don’t go on indefinitely. Using open loops in your emails is going to make sure people keep opening them. Don’t close a loop until you’ve opened a new one. 01:08:53 When the next email comes in, you now need to open a loop. It doesn’t always need to be at the beginning of the email, this is just a simplified example. Start talking about whatever you need to talk about, then open a loop by saying, “Here’s a thing but I’ll tell you more about that in a little bit,” or, “We’ll get to that later.” Then you close the first loop from that previous email. This way you keep people engaged. Most people don’t do this; they send out single emails that are basically a repurposed blogpost. 01:10:04 Ben: Creating open loops depends heavily on already having some of this content in place ahead of time. The best way to do that is to be writing and producing content daily. If you’re wanting to create anticipation, you need to have stuff on deck, and in order to have something on deck you have to be writing daily. 01:11:08 Sean: All the more reason to have a queue of posts. You might think, “I want to start a weekly blog!” Okay, but don’t just post today when you’re super inspired on a Saturday and promise to blog every Saturday, because then you’re going to get to next Friday night when you’re out with your friends and think, “Oh crap, that thing I said I was going to do…” If you’re serious about blogging, build up a queue of posts. Write four or ten blog posts and schedule them out and still write one every week. That’s going to prove you’re serious. 01:11:39 Ben: As long as you’ve got a queue, take a look at what you’ve got on deck and be purposeful about what order you’re putting things in. What kind of story are you telling over the course of several posts? 01:11:51 Sean: How can you weave it together? How can you relate these two adjacent posts to keep people engaged? 01:12:35 There’s a few ways you could go about this, and one may not be better than the other. I would experiment. Slightly stagger, but don’t overthink it. Rather than saying, “Everything posts at 8am on all of the things,” you’ll get a little more mileage out of it if you stagger. Some people follow you on multiple platforms, so if they’re on Instagram at 8am, guess where they’re not? On all of the other platforms. If you stagger, to some degree, you can catch those people. 01:13:14 If you’re not worried about those people being on multiple platforms, maybe because it’s really similar and you’re posting the exact same thing on Instagram as you’re posting on Facebook, you don’t expect people to follow you on both since they’re the same thing, then you can post at the same time. Generally, try to stagger it a little bit. 01:13:34 The podcast episode posts at 7am Central Time and the newsletter goes out at 8:30am. The main reason is because it takes a while to propagate through iTunes, and I want to make sure that when the newsletter goes out they can get it in their iTunes app, but it’s one example of staggering. When we post the promo video, that’s usually around 10:30 or 11am. I might post it on Twitter or Facebook a couple hours later. I stagger, but I don’t overthink it too much. A lot of people aren’t thinking, “I repurposed it and used all these mediums and staggered it a few hours apart like you said, Sean,” but what about days, months, or years? You can recycle. 01:14:26 Brent asks, “What if rather than just repurposing content, you reuse it? What’s the best way to breathe new life into an old piece of content?” You can bring back something old and straight up post it again. Rather than have everything go out all at once, space it out by a few hours, but here’s another idea: bring back old stuff and don’t just repost it, but re-integrate it and breathe fresh life into it. What did well before? Give that a new spin. You can use some of it; you could reuse a whole video you made, or, if you didn’t like the video, you probably wrote an outline, transcript, or blogpost, so use that and make a new video based on the same outline. Save your content and categorize it well so you can go back and find it if you need to. 01:16:20 Sean: I did this with Learn Lettering. In the 30 day hand lettering series I’m doing to promote the launch I’m writing posts on generally topics I’ve touched on before, but I’m tailoring it to lettering. I’m niching down and applying all the stuff I talk about on the podcast or make videos about to hand lettering. What does it look like to talk about repurposing content for hand lettering or finding clients for lettering? I’m doing that with each of the blog posts. 01:17:08 There’s a lot of seanwes tv videos that are relevent, so I’ll imbed the video in a relevant area of the post. I talk about finding clients for hand lettering, and in a seanwes tv video I talk about attracting clients instead of chasing them. If you have a video imbedded on a page, your page time skyrockets two to five times. That’s huge, and these are videos we did six months ago. The videos themselves are repurposed content from the tons of podcast episodes we’ve done. We’ve taken the most popular ones and distilled them down to the nuggets and good parts and we make a five to seven minute video out of it. It’s more digestible, more quickly and easily accessible for people to get those core principles and take them right away without investing in a long podcast episode like this one. 01:18:29 Ben: When it comes to staggering, I like the idea of not overthinking it. You can get yourself into a situation where your staggering is so complicated that you end up not being able to wrap your mind about it, and because you’re so worried about not giving people duplicate content, you’re putting yourself in a situation where you can’t keep up with when and where things happen. Putting some space between your different mediums gives you a chance to be present on those platforms when the thing lands and to have exclusive time there with that fresh content when people are first engaging with it. If you drop it all on different platforms at the same time, you can’t be in all those places at once. Plus, people may have the same kinds of comments or questions on different platforms, so you may be able to reuse your responses on various mediums. 01:20:08 The gold nugget is something I love about the way you present content. In the Highlights and Takeaways section, that’s a digest of golden nuggets. Over time, they become sayings, mantras, and bite-sized, super-infused-with-value information, because they not only apply to this specific subject, but they also apply to other subjects. It’s powerful when you have people using the same terminology and phrases while talking to a completely separate audience. Gold nuggets allow your thoughts and ideas to go into the world, where they can really change things. 01:22:00 Sean: When people are sifting through and trying to find gold nuggets, they use different filters: a really fine filter, a coarse filter, a loose filter, or an open filter. 1:22:25 When you talk about it again, it goes through that filter. You start with a fine filter and you’ve got big chunks—some of them are gold nuggets, some of them aren’t, but you put it through another filter. Maybe this filter is a little looser and other things are falling through, but the gold nugget remains. Eventually, you just have the gold nugget after it’s passed through the filtration so many times. It all starts with writing. When you have something in writing, it can take on any form—a film, a lettering piece, an audio recording, or a video on YouTube. You have it in writing. This is what made seanwes tv so great. Because I put in the effort to write thousands of words of my own shownotes before I hired anybody, I had this stuff in writing and I could repurpose it. When I went to make videos, I had it all in writing. The shownotes were right there. It’s ready to go; I can turn it into anything now. The possibilities are endless. Should I Reduce Quality For More Mediums? 01:23:51 Rafael asks, “Should I focus on bringing 90% perfection in only one media or should I try to bring a less perfect work in different medias for different kind of listeners, viewers, o readers?” There’s never less than 90% perfect. If the amount of effort it takes to get to 90% is too much, you have the wrong concept of 90%. Here’s how you know where 90% is: you lower the threshold until that bar is half of what it takes to get to 100%. Going from 90% to 100% is double the work, but only 2% of people notice the difference. It’s the point of diminishing returns. That’s why 90% is the sweet spot, but you don’t want to go below that because we care about quality. Work hard and find a way to give 90% on all of your mediums. 01:26:22 I don’t think of it in terms of math; I think of it in terms of hustle. The answer is to work hard and work smart—do both. If you want to get a two mile run in the morning, then run faster and get more time. Stay up later, sacrifice more things, do less fun things, and put in the extra effort to do all of them at 90% perfect. 01:26:55 Kathy asks, “I’d love to know your process for revisiting topics on the podcast, Sean, like the series you did 100 episodes later. Do you look at the topic and then just write a fresh take on it? Or do you look back at what you wrote first?” I do a fresh take. I don’t look back at the old notes and go off of those, and that’s easy because I’m in a new place. It’s a year later for me or however many months since you did this thing. You have new stories to tell, new experiences and new insights. Take the topic and create something new. I don’t have any temptation to just go off of my notes from last time because they feel outdated. I have new things to share, and that’s part of the beauty of the Magic of 7. It’s not just the repeating the exact same thing; if someone else said it before, you’ll say it different. If you’ve said it before, you’ll say it in a new context, with new insights, from a new angle, in a new time. Find ways to give unique value, however you’re doing it.